Cleaning sofa stains and spills. Upholstered furniture is susceptible to stains particularly for people who have pets or children; stains or dirt may come from pets, dust, mildew or simply household grime. Stains to upholstery fabrics produce greater problems than stains on clothing, the replacement price of a sofa is much greater than an item of clothing. Your sofa represents a large expense, prevention is better than cure, and we would recommend a stain resist treatment to increase the life of your sofa, one bad stain might ruin your whole suite. 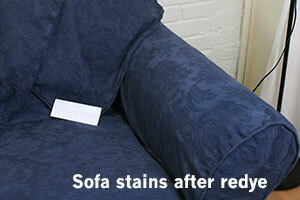 If the sofa were washed regularly we would advise a re-application of the stain resist finish every 24 months. 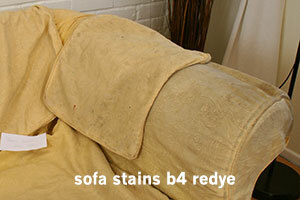 "Consider redyeing your sofa covers to remove stains and give your living room a new lease of life". By treating stains and spills the moment they happen, you are able to avoid the chance of the stain turning out to be permanent, extend the life span of your upholstered furniture and keep it looking as good as the day you bought it. Mud type stains - brush off the stain once dry do not rub while wet. Blood: Take a pint (half a litre) of water and add about 1 ounce of salt (30g) of salt and carry out the wet, blot, and wet tactic. Should the stain persist, try using a dilute hydrogen peroxide solution (you must test this in an inconspicuous area first as peroxide may discolour some dyes). Juice stains – Use a water based spot cleaner e.g. Stain magic. If none to hand try blotting with a solution of ratio 1:3 vinegar to water. Red Wine: treat immediately to soak up as much as possible with a clean dry cloth avoid rubbing. Next try blotting with a dilute detergent water mix and soak up with a dry clean cloth. If this doesn’t work try hydrogen peroxide mixed with detergent in equal parts dab, or wet the stain. (you must test this in an inconspicuous area first as peroxide may discolour some dyes). Ink: Apply a solvent such as nail varnish remover or hairspray to the ink then wash. Try dabbing with nail varnish remover then soaking up the residue with a cloth (again do a test on hidden areas first). Protecting the fabric from stain damages using stain resist treatments is advisable; this also noticeably increases life of the sofa. Consider re applying stain resist treatments every 24 months. Keep a clean cloth near at hand for quick blotting of spills. Avoid using the wrong type of cleaning chemicals; Unsuitable chemicals can damage sofa fabric permanently and NEVER USE BLEACH! Don’t wash cushion covers only you will get shade variation with the sofa base. Check the load capacity of you machine so as not overload it. Your detergent should be free of optical brightening or bleaching agents. Loose covers will fit more easily when slightly damp, so do not fully dry. It is best to dry the covers naturally, away from direct sunlight or artificial heat sources. Do not to tumble dry your covers! At this point the sofa covers could be treated with a stain guard treatment if required. We hope you have found these sofa stain removal tips useful.